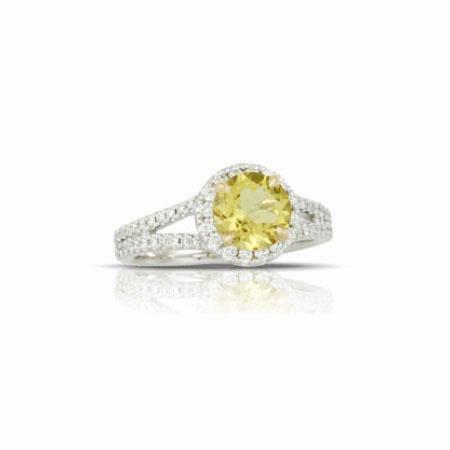 .36ct Diamond and Canary Yellow Beryl 18k White Gold Halo Engagement Ring. Diamond Details:60 round brilliant cut white diamond, G-H color, S/1 clarity, excellent cut and brilliance, weighing .36 carat total. Gemstone Details: Canary yellow beryl stones, of exquisite color, weighing 1.26 carats total. This incredible 18k white gold halo engagement ring features 60 round brilliant cut white diamonds, of G-H color, S/1 clarity, weighing .36 carat total, and canary yellow beryl stones, weighing 1.26 carats total.